The land of ice is a place like no other and I was blown away by its severe beauty, phenomenal aurora display and the quirky capital of Reykjavik . I wasn’t expecting my trip to be a foodie frolic and was pleasantly surprised and really impressed by the dining offer. Puffin and whale are not the only items on Iceland’s menu. What is really refreshing about Reykjavik is the lack of chains. There is not a Starbucks or McDonald’s tarnishing the main street. Instead independent café’s, coffee shops, bars and restaurants all with their own unique style and offering give this place such a nice vibe. There is a scattering of traditional Icelandic restaurants with menus dominated by seafood, whale, puffin and game but I just couldn’t agree with eating whale or puffin, even though I was told they have strict quotas on the hunting of these animals, it just doesn’t seem right to me. So we made a decision to avoid all restaurants which had them on the menu. And the food we ate and the restaurants we discovered were exceptional. Svarta Kaffi on Reykjavik’s main street is a cosy cafe with a unique offering. 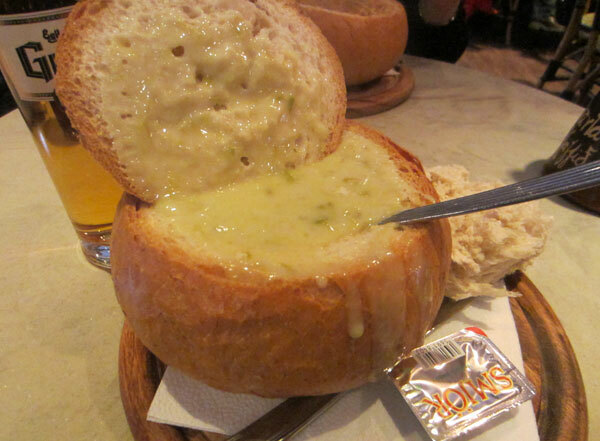 Homemade soup served in a crusty wholemeal cob loaf. It’s simple and totally delicious. There are two soups on offer daily, a veggie and meat option. A creamy asparagus and vegetable soup hit the spot and was perfect comfort food, warming us from the inside as the temperature dipped below zero degrees outside. And where else can you eat your bowl! The service is friendly and the prices reasonable, approx £7 for the soup. Washed down with a pint of local Gull beer it’s a great lunch spot. So much so that we returned for more on our last day. The foodie find of Reykjavik was Nuoluskalin. Seriously good noodles with fresh and fragrant ingredients and huge helpings to fill your belly. We stumbled across this little establishment and knew it would be good as it was bustling with locals getting their noodle fix for lunch. With just a few tables you might have a little wait but it is well worth it. I devoured a huge bowl of coconut noodle soup which was deliciously fragrant with lime and coriander and just the right amount of chilli to give it a kick. 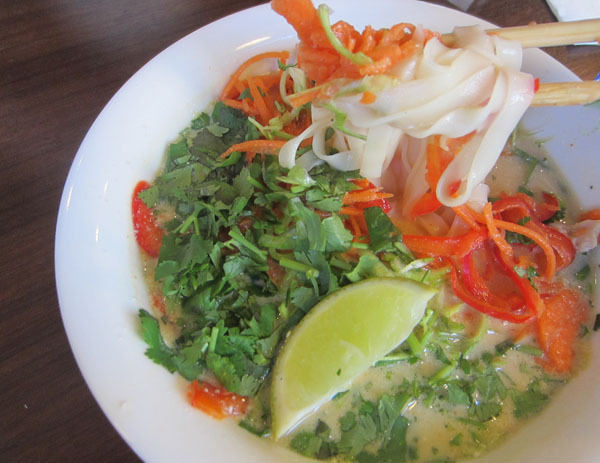 Quick, cheap and oh so good – who knew the Icelandics could make such amazing noodles! The prize for the longest restaurant name goes to Hamborgarafabrikkan! Now try pronouncing that quickly! Translated to The Hamburger Factory. And awesome hamburgers they do. 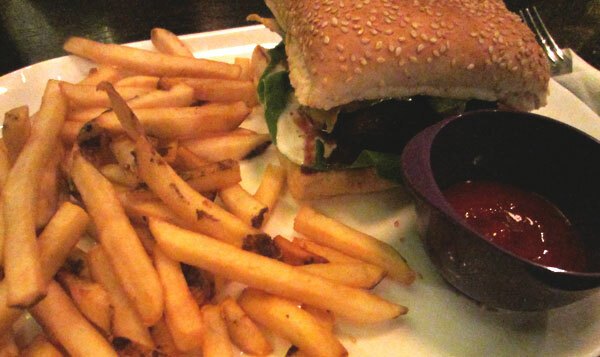 Set like an American style diner the restaurant is very family friendly and dishes out some seriously good burgers. 14 variations in fact. Ranging from The Trucker complete with a fried egg on top to Surf & Turf, beef with garlic tiger prawns. I was drawn in by the Ariba Son of Salsa. I love a bit of mexican to my burger, and this one ticked all the boxes. Top quality beef, guacamole, corn chips, salsa and sour cream. A nice touch for the veggies is that you can replace the meat in any burger with a Portobello mushroom, so there is no missing out! And I was delighted to discover a shaker of chicken salt on the table to generously coat my fries in. This is a condiment loved by Aussies and Kiwis yet severely lacking a presence in the UK! The burgers are fresh and filling yet not too massive that you need to be rolled out. We were eyeing off the alcoholic shakes and grown up’s ice-cream but that would have required staying for the long haul and resulted in a waddle back to the hotel. To be honest the fact that we were on a tight schedule to meet our bus for the Northern Lights tour was the reason behind my unusual display of self restrain! The most exciting discovery we unearthed in this land of majesticness was their unrelenting fondness for licorice! 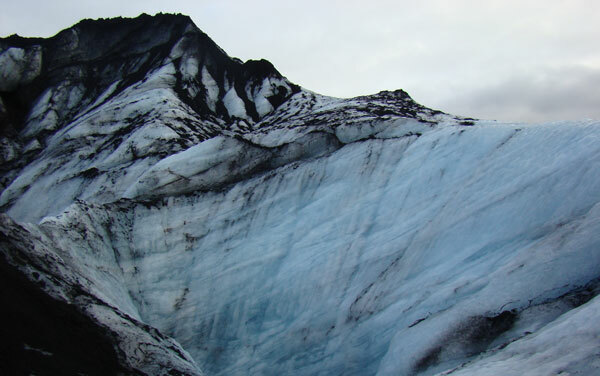 Glaciers, volcanoes, Bjork, Northern lights, puffins (alive not on your plate), and the Blue Lagoon – I was already in love with Iceland and then they throw in my favourite sweet, licorice! Oh how the love is erupting like licorice lava! 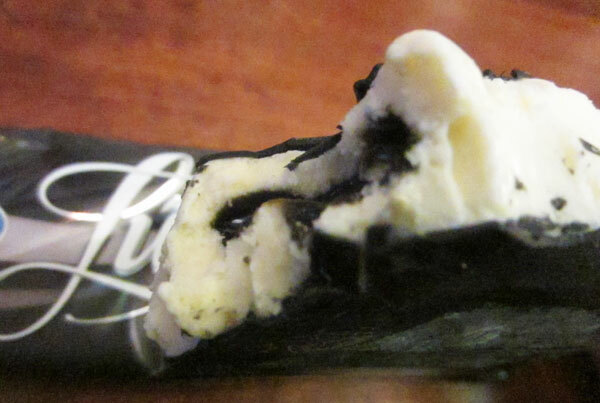 Licorice ice-cream has to be one of the best creations on earth. With a hard black exterior which cracks satisfactorily to the bite to reveal creamy ice-cream encasing a gooey licorice lava centre. Heaven on a stick! And no I didn’t stop at one, and have since been obsessing over how I can import this black beauty to the UK! Chocolate covered licorice twists, salted licorice, licorice drops, licorice chewing gum, chocolate bars with liquid licorice centres – and that is not the half of it! It is truly Licoriceland! And so with my suitcase weighed down with about 5kgs of licorice products I left Iceland totally in awe of a country which I knew so little about but now have so much love for. Hemmi & Valdi: Laugavegur 21, Reykjavík – Very cosy and chilled out bar and coffee house with comfy sofas and cheap beer. Happ: Höfðatorg, 105 Reykjavík – healthy, organic restaurant with a strong emphasis on raw food. 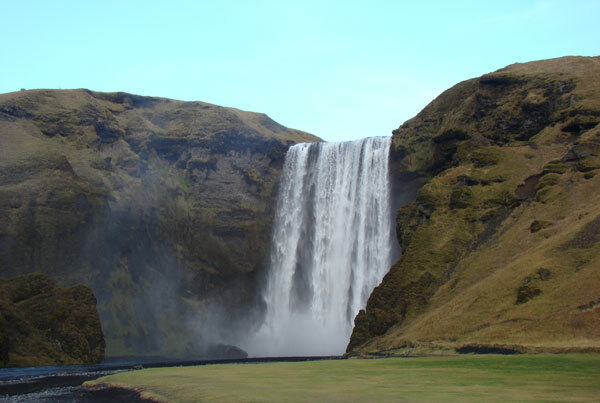 Thanks Sarah, I’m off to Iceland at the end of November – excellent reviews and I’ll definitely be sampling the soups and noodles! Hi Adele! You will love Iceland, have a fabulous time and yes def recommend tucking into the soup in a roll and the noodles were amazing! Hope you get to see the Northern Lights – truly spectacular!